All too often discussions of instability, insurgency and regime collapse are used interchangeably to describe the catalyst of a potential weapons of mass destruction (WMD) crisis in North Korea. In fact, these are related, but discreet phenomena with critical distinctions that need to be made when considering related WMD risks. Most planning or exercise scenarios assume that a sudden regime collapse—coup, revolt or abdication—would ignite a WMD security crisis in the North. These “inside out” regime decapitation scenarios envision crisis at the center of the regime followed by potential instability or insurgency—a la the collapse scenarios of post-Cold War Europe or the Arab Spring in the Middle East. In such scenarios, North Korea’s chemical, biological, radiological and nuclear (CBRN) programs may be physically secure (at least initially) even as command and control grows murky. The situation will either stabilize a “new normal” or deteriorate as a successor regime fails to firmly grip the reins of power. While such a situation is fraught with danger, it is comparatively easy to imagine the international system responding and potentially intervening, perhaps under the authority of the United Nations (UN) or through some form of multilateral division of labor among the key players. 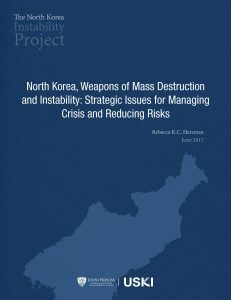 Far fewer plans consider a different and perhaps more insidious scenario in which the North Korean leadership gradually loses control at the perimeters and is forced to hunker down in strongholds around the capital, while at the same time fighting brush fires around the country to maintain order and allegiance. Even as the regime retains at least tenuous political control, these scenarios—exhibiting parallels to Pakistan, Afghanistan, Iraq, Syria and even Ukraine—can suggest the slow erosion of verifiable control and physical security of territory and programs in ways that are difficult to assess and greatly complicate intervention. It is critical to consider a range of scenarios with differing baseline assumptions to determine where challenges and opportunities for international response differ and where they remain constant.